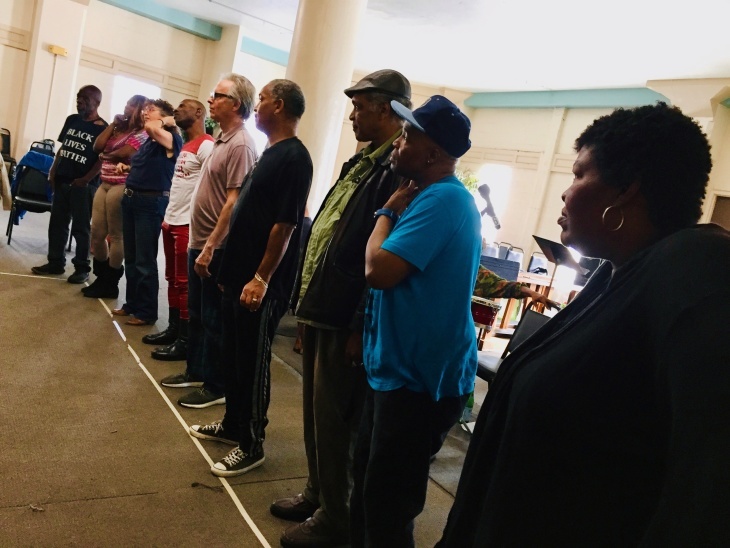 Most people know the acronym "LAPD" as shorthand for the L.A. Police Department, but it also stands for "Los Angeles Poverty Department" — an award-winning performance group made up of people from all over the country who wound up homeless on L.A.'s streets, forming on Skid Row back in 1985. Their aim: to tell stories for, with, and about homeless people. This weekend, the troupe presents their latest show, I Fly! or How to Keep the Devil Down in the Hole at the REDCAT theater downtown. They say they created the show after a beloved member of their community was shot and killed by police. People like Stephanie Bell, who live and work on L.A.'s Skid Row, have lots of stories to tell. Bell joined the Los Angeles Poverty Department a long time ago to make sure her stories are heard. She's worked with the group for 24 years. 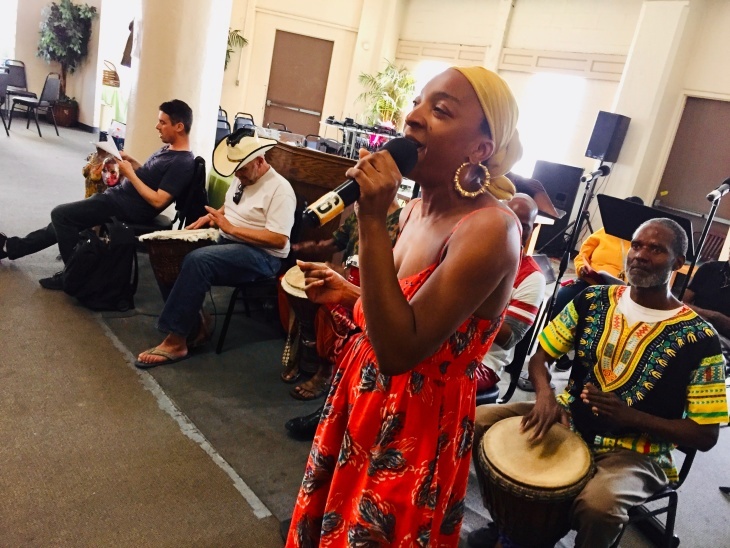 She loves to sing out about the joys and pains she's felt during the nearly three decades of living with this community. Bell said LAPD's shows even help her remember the friends she's lost along the way. "Matter of fact, I'll be speaking about one of them in my play — Kevin Michael Keith. That was my heart," Bell explained. "He helped a lot of people down here in the community, plus me, once upon a time. And then he passed away two years ago. He had cancer." John Malpede is the founding artistic director of the Los Angeles Poverty Department. He formed LAPD to collaborate with the residents of Skid Row. 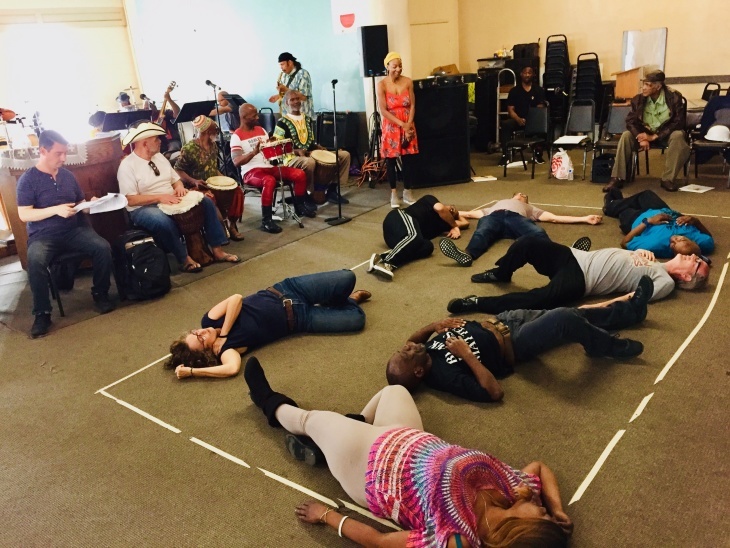 Their goal is to use theater, music, and spoken word as tools to confront the urgent issues of this community — from health, to happiness, to public safety. "I've been working here for three-and-a-half decades," Malpede said. "One thing that was clear from the very beginning was that because there is such a wide range of experience among people here, maybe more than in most places — that means that people here have a wisdom and a know-how to deal with a wider range of experience." Henriëtte Brouwers is Malpede's wife and co-director of their latest show. They've been rehearsing inside a large makeshift dining room at the Church of the Nazarene in the Skid Row neighborhood. It's a devised piece of theater — meaning there was no written script when the company started working on the play nearly two years ago. They began with writing workshops and acting exercises first, and then wrote the script based on their discoveries. Drummers from the Skid Row Playaz and a funk/soul band from the church eventually added the sound. Just outside the rehearsal hall, a half-opened fire hydrant leaked. Someone put down a bucket filled with dishes and clothes to capture the drops. Around the hydrant were endless rows of tents filled with folks going about their business. A few years ago, when the troupe was rehearsing a different show, they heard gunshots coming from a tent city. They ran outside, only to learn that police had shot and killed a community member known as "Brother Africa," Charley Leundeu Keunang. "It was like everybody came back were just in shock. We couldn't do a rehearsal," Walter Fears, a core member of the troupe, said. He remembers that day well. Police ended up settling following an excessive force verdict for $1.9 million. "What can you do besides police the block, you know, 24 hours?" Fears said. "What can you do besides create a piece or march — you know what I'm saying? We went back to rehearsal with all these things. People were crying. People were upset. We couldn't rehearse anymore that day." But what they could do was turn their anger and sadness into this new show — inspired by Brother Africa's death. The show explores issues of public safety. It asks the question: "What can residents do alongside law enforcement to keep people safe?" 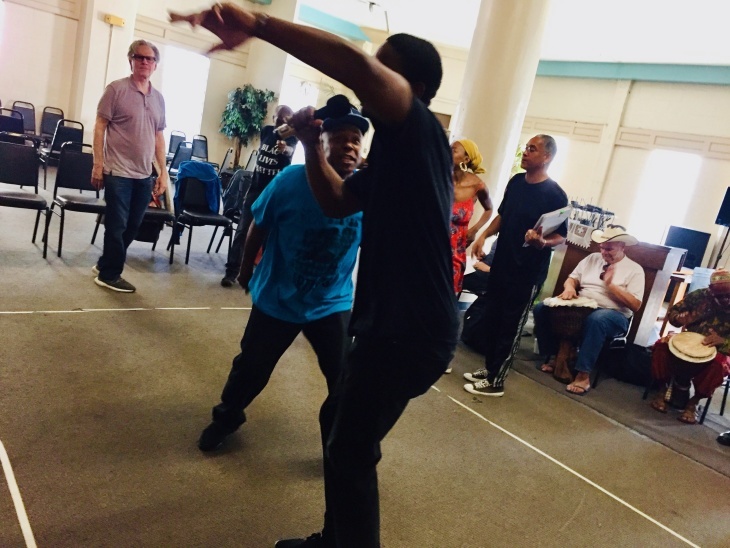 The play is set at the Festival for All Skid Row Artists. That is an actual annual event at which performers from Skid Row share their work with the public. This October will mark the 10th anniversary. While it's taken years to establish art as a regular presence in the community, Walter Fears fondly remembers those early days when John Malpede and Henriëtte Brouwers would hold public meetings to raise support. "And then they were here doing this symposium — it was all these white people there talking about black people, and I was like, 'what?'" laughed Fears. "How y'all going to talk about black people? There ain't no black people in here, you know what I'm saying? They came up to me and they said, 'Well, why don't you come to our space?' They invited me that night, and I've been with them ever since." Fears said he's originally from Tupelo, Mississippi, and comes from a family of sharecroppers. When he originally joined LAPD, he said, he found himself living on the streets after graduating from college, joining the military and teaching in Orange County. A swimming pool accident left him unable to work while recovering in a hospital for months. Eventually, symptoms of PTSD stemming from his military service slowly crept up on him. And soon, he said, he became addicted to meds. But he was unable to complete his treatment. "The insurance company dropped me. The hospital kicked me out. That's how I ended up on Skid Row," Fears aid. "My first night, it was a little scary. It was horrible. I had no idea, the first thing about being homeless. I ended up meeting a guy who was a veteran. He showed me how to dumpster dive, you know, go get cardboard and tie it up so you can crawl inside and the rats won't get in. And the next morning, he took me to the missions — where to get food, get exchanges of clothes, and showed me where the doctor was — the eye doctor. And I was just blown away, because there were all these services here! [Laughs.] And you couldn't get these in Orange County, but here they are." Fears felt that there should have been a support system to catch someone like himself — a working person and a veteran. "But there wasn't. But it was the best thing that ever happened to me, because I ended coming here and finding myself," Fears said. Now Fears has a place to live and a new wife. But he keeps coming back to work with LAPD and his friends in this neighborhood because, he said, there's still lots of work to be done. "Because this community, in a way, it saved me," Fears said. "Because these people, they took care of me when I couldn't take care of myself. That's the nature of Skid Row. People look out for each other here." The Los Angeles Poverty Department's show I Fly! or How to Keep the Devil Down in the Hole plays through Saturday at the REDCAT theater in downtown L.A. Listen to this story on KPCC's The Frame podcast.